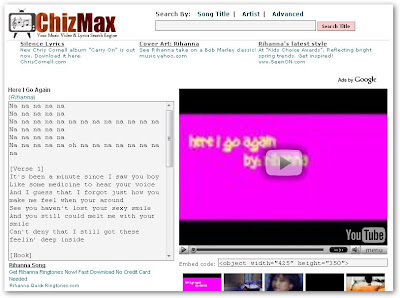 ChizMax is a specialized search engine for music lyrics and videos. To find the lyrics for a track, enter a song name, artist, or a combination of the two to bring up a listing of tracks that are covered by the ChizMax search engine. Each track has its own separate page with its full lyrics and a music video from YouTube if it's available. Thumbnail images from the video also add a splash of color to the otherwise spartan interface. Of course, now that Yahoo has launched an officially licensed music lyrics service, user-transcribed lyrics sites are in danger of becoming irrelevant, but ChizMax has nicely integrated text and video into a lightweight page that music lovers who don't mind the occasional typo may prefer.